There are nine saints of Islam in Indonesia, especially on the island of Java. Muslim call them Wali Songo who have the historical role in the spread of Islam in Indonesia. Javanese Muslims have a tradition of making pilgrimages to Wali Songo Grave. Usually, they do it during Rajab and Sura, the first and seventh months of the traditional Javanese calendar. But, they also do it aside from that time. Five of them were buried along the coastal areas of East Java. There are Sunan Gresik and Sunan Giri (Gresik), Sunan Ampel (Surabaya), Sunan Drajat (Lamongan), and Sunan Bonang (Tuban). They are called Wali Limo. In order to make a journey is lessened, the Muslims in East Java only visit it. In addition, to visit Wali Limo, they also visit the grave some of The Wali that had been respected. They are Sunan Asmorokondi, Mbah Bungkul, and so on. Although not including Wali Songo, they are considered to have contributed to the spread of Islam on the island of Java, especially in the eastern of it. On a Sunday morning, I had booked with Ibu-Ibu Pengajian*. It was the time to make a Wali Limo Pilgrimage tour. I knew this was the best moment of them to take off their surfeiting in act. As a matter of fact, there is no more time to do it. All the same, they had worked hard to collect a piece of the tour cost. I must bear in mean that they have a financial problem. Guiding them to reach their happiness, I just wanted to try delivering of its. Didn’ I? The first of the journey was Sunan Drajat. He was the member of Wali Songo, along with his father Sunan Ampel and his brother Sunan Bonang. His grave in on Paciran, Lamongan. It is closed to Wisata Bahari Lamongan, one of the best amusement park in East Java. Only a few meters far away from the seaside, I drank a dozen of mineral waters after we had been dropped on entrance area. No words can describe how a hot area it was. Some of the tour participants were taking a picture. The landscape of hills behind them was being an attractive background. Because of my illness, I had preferred to sit on the bus along with the bus driver who played his gadget. I would follow them after the narcissistic event had been completed. 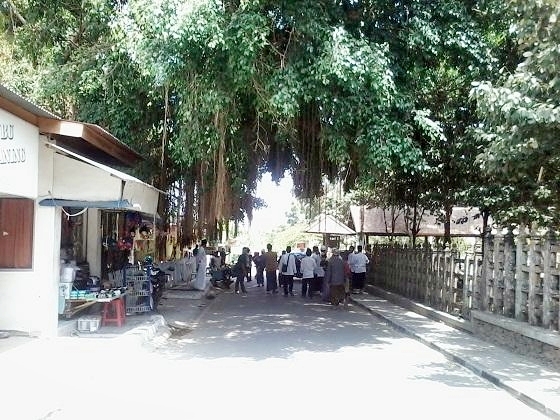 The grave is in the area of Sunan Drajat Mosque. It is surrounded by many graves of his family, friends, and the locals who had supported him to spread Islam. Many of them are unnamed. But, in spite of not knowing of their identity, there are still being respected. Their graves are fenced by a woodcarving which describes the ornament of Sunan Drajat Mosque. The ornaments on the woodcarving were attracted to me and so do the women who sat on the desk in front of it. They were doing their epic business, coin exchange service. 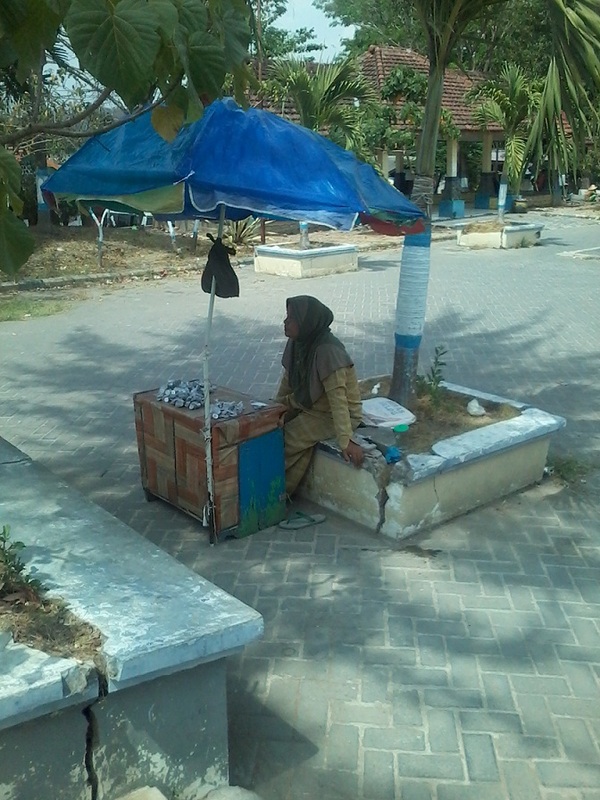 They provided 500 rupiah coins to be given to beggars around the area of the grave. Nine of coins were wrapped in the plastic bag. The pilgrims who want to get it must pay 5000 rupiahs. 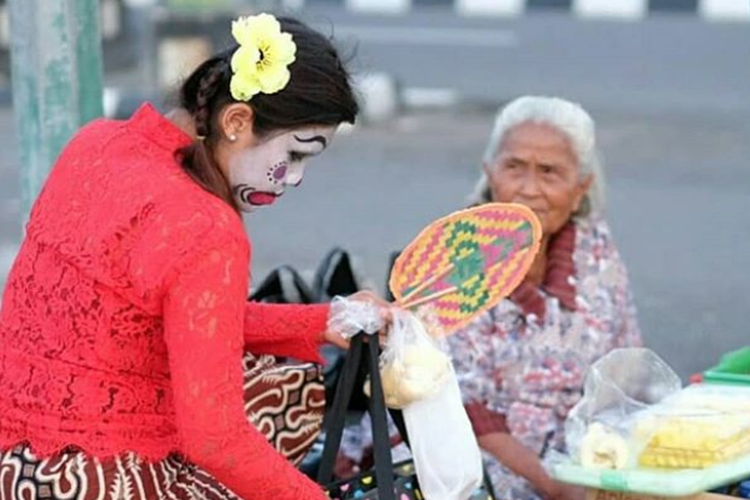 So, these women got 500 rupiahs in every bag. Indeed, what I had seen was quite contrary to my religion. I knew it was known as Riba, literally means an "increment' or addition". In Islamic Fiqh, the term riba has a special meaning. Riba is an unjustified increment in borrowing or lending money, paid in kind or in money above the amount of loan, as a condition imposed by the lender or voluntarily by the borrower. Heneng - Hening - Henung (In a state of calmness we will acquire silence and in that serenity, we will achieve our goals). Remaining of his philosophy, I caught a sight of a massage of the saint who has a nickname Raden Qasim. He concerned about the poor which is listed on The Quran and Ahadith. Sunan Drajat suggested the locals to help each other especially to their relatives who lived in poverty. Allah says verses form Quran : Those needy ones who are wholly wrapped up in the cause of Allah, and who are hindered from moving about the earth in search of their livelihood especially deserve help. He who is unaware of their circumstances supposes them to be wealthy because of their dignified bearing, but they do not go about begging for people with importunity. And whatever wealth you will spend on helping them, God will know of it (2:273). A child who "lead" a group of women was shouting to the visitors to give them a coin. Based on this, the needy ones is the important thing to concern by Muslims. But, it’s better to empower them so that they can live better. Unluckily, there were so many beggars on the grave complex. Not only children but also adults carried many kinds of the box which were used to collect the coins. They sat in and shouted for money. It was made me uneasy. In fact, they seemed to be used to be beggars. 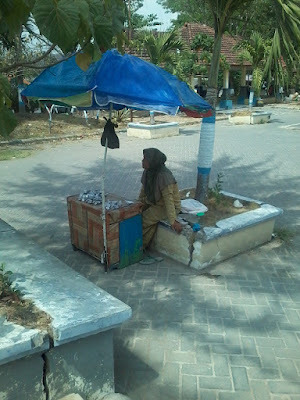 The woman who sold a plastic bag of coin was the proof. Wasn’t it? 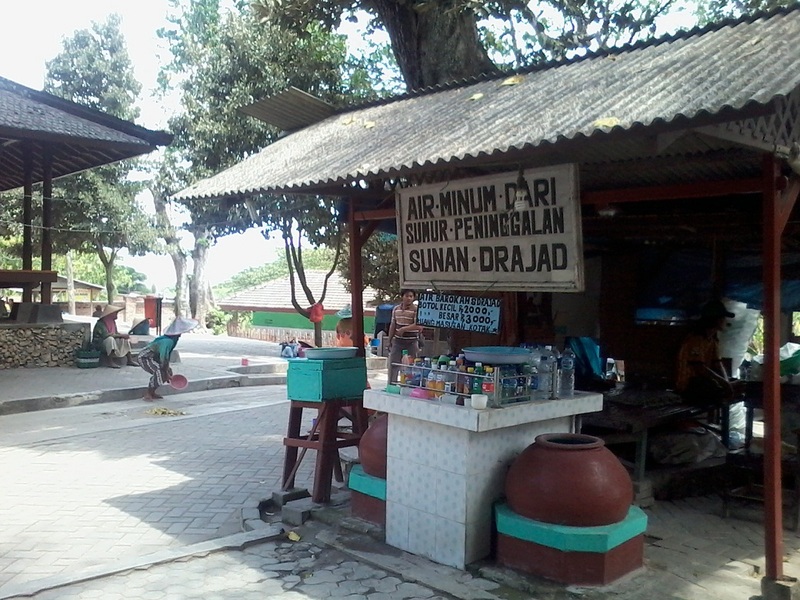 The shop which sell a bottle of holy water from Sunan Drajat well. Have you seen a group of beggars overthere? In my humble opinion, they can be more empowered. They can work in guiding the pilgrimage and explain them all of the information about Sunan Drajat. Or, they can be trained to make a handicraft. Apart from this reality, I got a lot of valuable lessons in this area. 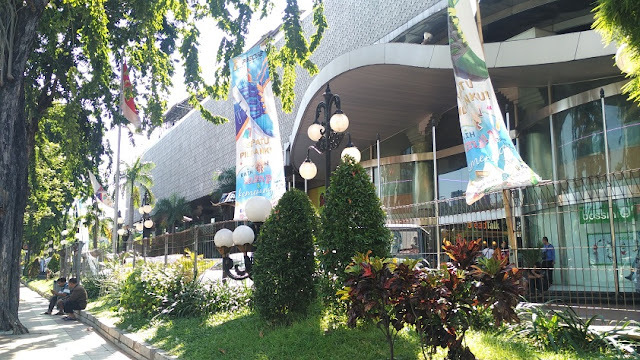 Morover, the museum behind the mosque displayed all of the historical objects on Sunan Drajat history. I got a lot there. * A group of woman who read Quran and Diba’ together. Saya mencari widget translitenya tidak ada ya? jadi kurang begitu mengerti apa yang disampaikannya. Talking about beggars, that's why I barely give them money. Perhaps, they are lazy? jajajajajaa how dare you sist?